I'm 24 years old and have lived in Bristol, Tennessee my whole life. 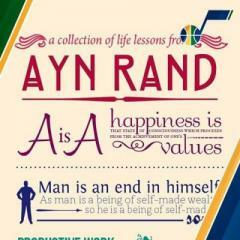 I first heard of AR because of an old South Park episode called "Chicken Lover," and I discovered Ayn Rand because a lot of the people I respect kept bringing up her name and I decided to look into her books and philosophy. Upon reading articles on the ARI webstie and the "Essentials of Objectivism" in the back of The Fountainhead I decided that I was an Objectivist. My favorite lovecraft story is Dream Quest of Unknown Kadath. Ninth Doctor Ninth Doctor said, "But why any at all? I don't know of any such books attacking Ludwig von Mises, for instance. Well, I think it's just that Rand is so much more influential, therefore there's a market for smear jobs of her. I don't think a deeper explanation is needed to account for it." Agreed. I just get really irritated by the obvious (to me) lies and distortions, and even people who profess to have read the book and don't have an axe to grind say silly things, I saw Steve Moore on CNN being interviewed and the interviewer said that Rand had a mantra of "live only for yourself," and they talked about with virtue of selfishness (which they almost always do) acting as if Rand opposed any and all charity and voluntary assistance to those one cares about, Steve's error was basically saying that AS is about "how you grow an economy." It's frustrating. I read several of the reviews, and the general consensus was ok to mediocre, so I’m not going to bother, I’ve got the book and I’m fine with that. My apologies, I should have phrased the question more carefully. What I meant to ask was what is it about Ayn Rand particularly where we get these kinds of books? It’s not the lying that’s unique, it’s the consistency, we have a slate of these books, and I didn’t even mention, http://www.amazon.com/Without-Prayer-Rand-Close-System/dp/0940931508 this one, or this one, http://www.amazon.com/With-Charity-Toward-None-Philosophy/dp/0822601796. Which are older books, but still it amazes me that they’re praised for their “knowledge” and understanding but don’t posses either. For instance, the review of the first book says, “John Robbins is unlikely to receive much respect from Objectivists, since he is a devout Christian -- a sola-scriptura Biblical inerrantist whose critiques of Rand are mounted on a thoroughly Calvinist foundation and offered for clearly evangelical purposes. The loss is theirs; Robbins knows "Objectivism" better than most of Ayn Rand's most devoted followers -- including its all too numerous flaws,” and then goes on to say this, “Especially good are his attacks on Rand's "empiricism" and "materialism," positions she did not officially support although Robbins is correct that she was committed to them anyway.” Me thinks he doesn’t understand what materialism is. Sheesh. I guess the reason why I notice the smears on Rand and not other thinkers, is because I pay such attention to them. I don’t get into to many discussions about Kant. I guess the reason this stuff makes my blood boil is because I try my hardest to make sure that I clearly understand something before I attack it, and these people don’t seem to be putting forth even the minutest effort. They make such obvious mistakes it makes one’s head spin. I think this particular facebook page sums up the kind of nonsense that makes my blood boil (that is if it’s real, please tell me it’s not that it’s a joke and I’m taking it way too seriously), http://www.facebook.com/pages/Objectivism-For-Children-Its-OK-To-Kill-People-If-Theyre-Homeless/202256746479098. I have a question and maybe it’s a dumb one, but bear with me, “What is it? Particularly about Ayn Rand, that the people who criticize her and what she wrote, are either dishonest, or completely ignorant?” I am constantly amazed at how many of these people have absolutely no idea what they’re talking about, and yet they talk with a tone of authority which would lead one to believe them experts. It seems that the only books that I’ve ever seen about Rand that in any way get it right are written by Objectivists, and the rest are books by hacks like this guy. I haven’t read the books by Heller, Burns, Scott Ryan, etc., and I won’t be reading this one (personally I think this glowing review on the Daily Kos says everything that needs to be said, http://www.dailykos....n-by-Gary-Weiss), but I’ve heard and read things said by the authors that tell me that they haven’t the first clue what they’re talking about, and so why should I waste my time and hard earned money on a book written by a clown who hasn’t the first clue what he’s talking about? I sit back and I read this nonsense and I have to think that it's a complicated mixture, of ignorance, misinformation, and fear. I remember when I first heard of Rand, it was the South Park Episode Chicken Lover, it was the end of the episode where he holds up a copy of Atlas and says that he’s never going to read again. I commented to my Aunt who was in the room that I had never heard of her, and she said, “I heard she was crazy,” and I remember thinking, You heard, so hearsay, and you believed, because? Where’s your independence? Didn’t you want to find out for yourself before you make judgments like that? Apparently not, I think this is the kind of thing that happens to people, but it varies from case to case. http://www.dailykos.com/story/2010/5/21/10855/7114 WOW. These people are morons. My favorite ridiculous quotation in the midst of this mess was issued by Chris Kofinis who said on MSNBC (essentially), "This isn't philosophy class, it's the real world." I've watched horror movies, since I was about 10 years old. I've seen about 750 of them believe it or not. I don't watch them for philosophical context; I watch them for pure entertainment purposes. The wonderful thing I've always found in horror movies is how alien they are from the real world. I walk away from a horror movies, rejuvenated and more appreciative of how safe and benevolent the real world is and that things in them can't possibly happen. It’s extremely hard to find horror movies that fit into O’Ist ethics because most horror films take place in a supernatural world. The few examples of horror movies I can think of that take place in a realistic world would be, (The Descent and Quarantine), but they are few and far between, and you're even less likely to find an O'Ist horror film. Before I became an Objectivist I spent a lot of time on generic atheist websites and I got a lot of e-mailed information and articles that I read and that only occasionally touched on economic issues, but the more I read the more I realized that the atheists who I was reading didn’t know jack about what they were talking about. Here’s a prime example of the nonsense that drove me away from them: http://www.secularhumanism.org/index.php?s...ge=kurtz_29_2_1 “Given the current crisis, it is clear that both extremes are mistaken. A robust economy needs a dynamic free market to initiate innovation and entrepreneurship as well as government regulation and public programs that the private sector cannot support—a strong infrastructure, public-health facilities and public schools, highways and bridges, military defense, and investment in projects that private capital is unwilling or unable to finance.” The errors in this should be obvious but I’m going to lay them out anyway. A “dynamic free market” doesn’t need regulation, or most of the public programs he advocates. And how does he know that the private capital wouldn’t finance schools, highways or bridges? How does he know that the “private sector cannot support any of the things he lists? “Larry Kudlow, NBC’s perennial optimist, proclaims the triumph of capitalism, but it surely should not be “unfiltered” capitalism. Why? Because we now recognize the need for a balance between the private and public sector. This means mixed economies with a strong free-market component, government regulation and vital public projects.” The obvious error here is still fun to point out. We have already tried a mixed economy and that is what has failed!!! The “unfiltered” capitalism he talks about is a myth! “An unregulated stock market can lead to abuse and chicanery—such as the Ponzi scheme attributed to money manager Bernard Madoff. The Securities and Exchange Commission was unable to protect the public from fraud. Effective regulation must be reintroduced to protect the public interest.” We have a heavily regulated stock market and Bernard Madoff still got away with his ponzi scheme! As a matter of a fact the SEC knew that Madoff was running a ponzi scheme and did nothing not because they were “unable” but because they chose not to act. Regulation doesn’t need to be reintroduced; it was there and didn’t do any good. "Variable interest rates have been imposed on unsuspecting homebuyers who did not read carefully the terms of their mortgage contracts—and were subsequently hit with higher rates than they were unable to pay and forced into bankruptcies and foreclosures. Banks need to be more stringent in determining who qualifies for a loan. There should be some protection against predatory mortgage lenders who have abandoned standards of ethical conduct." Unsuspecting? Notice how he gives a pass to lazy or incompetent people who “did not read carefully the terms of their mortgage” as if we should shirk responsibility and forget that they if they didn’t read the term of their mortgage it’s their own fault. He also ignores the problem of why a bank would loan money to people who can’t pay them back, why would a bank engage in such irresponsible behavior of their own volition? “The unlimited free market has destroyed manufacturing in many affluent nations in North America and Europe, with disastrous consequences for their societies. With the loss of jobs, we face a dilemma: free trade is important but not if it means the destruction of the manufacturing base of a country.” Not to beat home a point too hard but what unlimited free market? This is nonsense, unions have destroyed manufacturing in North America, as well as regulations. (I’m not an expert on this particular subject and this is an educated guess based on what knowledge I do have, if someone on this site knows more about why manufacturing has suffered in North America I would like to know, but my argument still stands What unlimited free market? To add insult to injury Mr. Kurtz finishes with the following hilarious paragraph: “The Obama administration faces a Herculean task in balancing these conflicting principles. We ought to avoid outdated ideological mantras—whether it be the view of government bailouts as a savior or of an unlimited free market as a panacea. We need to develop pragmatic policies that work without appealing to the simplified slogans of the past. In the last analysis, science and reason are essential if we are to solve these problems. This should blend an expression of goodwill with a sense of optimism that we can overcome our current problems.” After the litany of factual and logical errors that he’s made in this brief piece he has the gall to advocate reason? In the entire article he provided not one piece of factual evidence of the “unregulated free market” that he bashes repeatedly. He merely makes assertion after assertion and they’re all ridiculous and impossible to take seriously. I have found this type thinking on many atheists web sites, and forums. Apparently the stringent logic and appreciation for reason that many (not all, I am an atheist after all) apply to religion has no place when it comes to analyzing economic matters, they seem more than happy to spew what sound like rehashed democratic party talking points. It’s arguments like this that made me sick of going many atheist sites. On a personal note I feel that many atheists ignorance of economic matters stems from a lack of interest. They’ve spent a lot of time studying philosophy and religion and not a moment of time reading anything on economics or pubic policy. I live in Bristol, Tennessee. Where do you get your news and information from? I watch a lot of cable news and in between aneurysms occasionally I hear someone say something that makes sense. I was wondering where the members of this forum get their news and information from. (Keeping in mind that I don’t have internet access.) I have a hard time finding anyone hwo makes any sense. Whom do you trust? Why are you an Objectivist? I actually stumbled upon Objectivism through reading David Boaz's book on Libertarianism, and reading Michael Shermer's book The Science of Good and Evil I also enjoyed watching Penn & Teller's show BS and over and over Ayn's name kept coming up. I went to the ARI website and started reading articles, I got a copy of The Fountainhead and Atlas Shrugged and read the essentials section and I found that I agreed with all of it.